Regina, Saskatchewan hasn't changed. The city where I went to university and left last year after deciding I didn't want to finish school is very much the same place I moved away from. What would really change that much anyway, right? I went to the university - yup, this is still the same. I went downtown - the same. Even the Denny's we used to go after drinking - same. I obviously feel very different than the tired and stuck student I saw myself as at this time last year. After working to pay down my debt, getting paid to actually edit and shoot, and finding new passion in my personal productions, there was a part of me that believed returning to Regina was going to feel epic. The spring air, the lighting, all practically the same as when I packed up the Buick and headed home. What I saw instead was the reason I left. Aside from my good friends, Regina had no more relevance to what I wanted to do now, than it did in March of 2008. 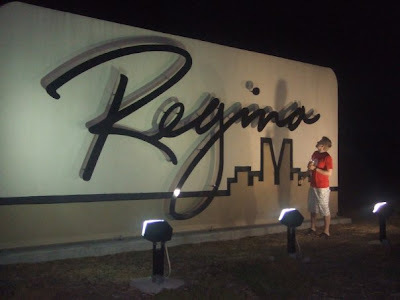 Me next to the Regina sign, celebrating on one of my final nights there. Without effort things fell right back into place. Strolling through the uni hallways with Tyler felt like any other day I was there, and if I wasn't so focused on finding meaning I probably would've accidentally tried to get into my old dorm. Another year older, a bit more confident, and still as uncertain about the reality of my choices. Leaving school isn't a regret, but a reminder of a different path that I clearly saw and at the last minute decided not to take. Somehow, thinking about my own potential has only become more exciting. The weekend was significant for another reason. It was around this time last year, that chatting with my friends Dave and Tyler, we recorded ourselves talking about our favourite film school experiences and memories. I had already clearly stated my plans not to return, but the recording proved just how meaningful the whole journey had been. It was the kind of conversation we'd had hundreds of times, but on the cusp of breaking away from years of formal education, it felt more significant. I don't suppose Regina will ever really be as different or as personally revealing as my imagination says it should be. Instead, it'll always remind me of change and the choices that ultimately resulted in the path I'm on. A living scrapbook that I was a part of for a few years. As long as friends are there, I'll go back. They were always the best part of the experience anyway, and as I'm sure most would agree, they're the best connection we have to where we've been, what we've done, and where we want to go.